When it comes time to clean your most sensitive garments, it’s hard to trust just anyone. Not only can formalwear be expensive and delicate, some garments are associated with precious and priceless memories. At Ideal Bridal and Dry Cleaning, we have over 25 years of experience working with the most priceless of all garments – wedding dresses. With the knowledge, experience, and understanding of delicate clothing and fabrics, we’re the smart choice for cleaning and preserving your formalwear. What are the Benefits of Professional Dry Cleaning? While water is capable of shrinking, distorting, or causing discoloration in fibers and fabrics, dry cleaning helps restore garments to like-new conditions without these risks, making it ideal for sensitive, valuable, or sentimental garments. One of the primary benefits of dry cleaning is that the specialized fluids used to clean have the ability to dissolve grease, oil, and other difficult stains much more effectively that with water. Not only is dry cleaning safer than washing at home with water, you don’t have to do it yourself! Simply drop your clothes off at Ideal Bridal and Dry Cleaning and we’ll do the rest. With over 25 years of experience providing professional dry cleaning, as well as tailoring and alteration services, we know fabrics inside and out. Not only does this help us remove pesky stains, but we know how to treat your garments without damaging them. Do you have a vintage garment that has seem better days, or do you want to prepare a gown for long-term storage? We have the tools and techniques to provide professional restoration for even the most delicate family heirlooms or vintage garments, as well as preserve a garment’s lifespan for years to come. When garments age, have been exposed to smoke, or been stored in damp areas, they can develop musty, unpleasant odors that can are very difficult to remove. We use advanced techniques to eliminate even the toughest odors without risking any damage to the garments. For pricing, availability, or more information about our professional dry cleaning services, contact Ideal Bridal and Dry Cleaning today. 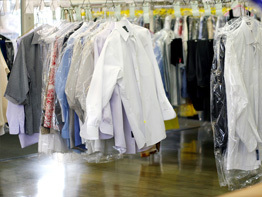 We offer affordable rates and fast turnaround for all your dry cleaning needs. Our store is conveniently located in Livonia, near Novi, Northville, Westland, Farmington, Farmington Hills, and the surrounding Southeast Michigan areas.